Spanish "pastelerias" or pastry shops are fabulous. There are several on each block, and as you walk by, you'll see beautiful, mouth-watering, hand-made cakes and pastries. Combined with the aroma, it is hard not to take a step inside. In addition to fancy pastries, there are many classic or traditional Spanish desserts. This list contains the most beloved by both Spaniards and visitors. Turrón is a very old, traditional sweet of Moorish (Arabic) origin. 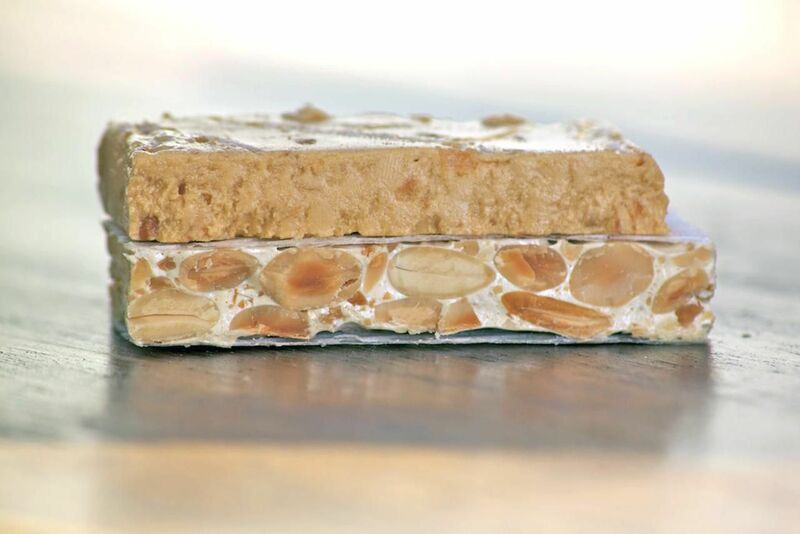 This Spanish Almond Nougat is the traditional Christmas treat in Spain. The original​ turron is made primarily from almonds and honey, but today it comes in a huge variety of flavors. Say "mantecados" to a Spaniard and watch their eyes widen as they remember the rich, crumbly cookies they eat at Christmas. They are truly a favorite. And, no wonder - they are so soft, they melt in your mouth. Light, with a delicate anise flavor, words do not do them justice. You just have to make them understand why they are a Spanish favorite, and why no Spanish home is without "mantecados" at Christmas! Ranking right up there with mantecados, rich and crumbly "polvorones" are a delicious cookie, especially popular during the Christmas season. The name comes from the word "polvo," meaning dust. You might think that is it odd, but they are so delicate that they appear to be dust, and must be handled carefully. They are very rich and practically melt in your mouth! The classic flan is vanilla egg custard, topped with caramel sauce. It is one of the most popular desserts, served everywhere in Spain. Vanilla is the classic or traditional flavor. "Crema Catalana" or Catalan Cream is the Catalan version of the creamy and delicate "crème brulée." It is also called "Crema de Sant Josep," or St. Joseph's Cream, traditionally prepared on March 19th, St. Joseph's Feast Day. Once you taste the burnt sugar crust and delicate creamy custard underneath, you may eat the batch all by yourself. "Churros" are fried dough fritters, which look almost like French fries. The best way to explain them is to say that they are the Spanish equivalent of doughnuts. Instead of a little ring like a doughnut, a "churro" is normally long and relatively straight, with ridges. ﻿After frying, they are cut into lengths and topped with sugar or honey. Served with thick hot chocolate, they are a favorite late-night Spanish dessert or even breakfast! Light and fluffy and melt-in-your-mouth, Spanish "bunuelos" or fritters are perfect for an afternoon snack or dessert. They are lightly fried, fluffy rounds of fritters, dusted with powdered sugar or filled with pastry cream, egg custard or marmalade. Spanish custard, called “natillas” is one of the comfort foods that make many Spanish adults recall their childhood. Our traditional “natillas” version makes a smooth, rich custard, flavored with cinnamon and vanilla extract, which is wonderful eaten while still warm.